Based on pure Dead Sea Mud and enriched with essential oils. Formulated specially, to recover and balance your scalp condition, provide amazing shine, softness and natural feeling to your hair. The delicate unique formula enriched with Argan Oil, Amla Extract, Olive Oil, Shea Butter, Borage Seed Oil and Vitamin E.
Our unique formula enables your hair and scalp to benefit from NAATM (Natural Anti – Aging) technology, it insures a long lasting protection of your scalp improve dramatically the hair health and look. Anti-Aging – Dead Sea mud is renowned for its ability to renew the skin, reduce the appearance of wrinkles, smooth and soften, leaving the skin looking younger. Help the skin retain water and keep it moisturized. More moisture in the skin leads to a reduction in the appearance of wrinkles and the prevention of new wrinkle formation. Detoxifies – Gently dexfoliate the scalp, draw out impurities and toxins, also great for oily and irritated scalp. Increases circulation. Circulation helps bring vital nutrients and oxygen to your cells as it carries away toxins and wastes. Improves the Scalp and Hair – Dead sea mud is high in minerals, such as sodium, chloride, magnesium, potassium, iron and calcium, so it nourishes the scalp. Also naturally softens and moisturizes, so it dramatically improves the appearance and health of your hair. Directions: Wash your hair with Style shampoo. 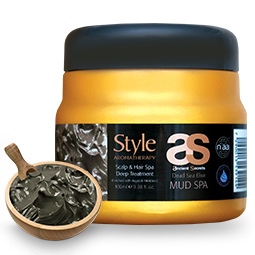 Apply a generous amount of Dead Sea Mud to scalp and moist hair. Gently massage into the scalp and hair, using circular motions. Leave for 15-20 minutes. Rinse thoroughly with warm water only.